Annie is asked to be maid of honor by her best friend Lillian but after meeting the rest of the bridesmaids she realizes the role will be more than she expected both psychically and emotionally. "Bridesmaids" is a film that defies its title. Not in the kind of way where it is not about bridesmaids, because it very much is. It is a film that defies the preconceived notion most males will have when reading a title like "Bridesmaids." I'm generalizing here, but a majority of men when hearing the words "bridesmaids" will potentially tune out. They will dismiss the film not giving any thought that it could be worth their time. Call it a defense mechanism or call it chauvinism, either way it is a common trait that both men and women share alike. Certain words can force a automatic reaction either positively or negatively but "Bridesmaids" rises above any negative reaction males may have in the title. One reason "Bridesmaids" is able to rise above any initial preconceived notions is its ability to house both honest hilarity and total crudity. Kristen Wiig and Annie Mumolo wrote a risible comedy that is filled with nonsensical situations and characters but it also is trimmed with genuine heart. Take the relationship between Annie (Kristen Wiig) and Lillian (Maya Rudolph), these two are best friends and they share some memorable moments on screen together that are not there for cheap laughs by any means. Scenes that show the bond between two women who have been friends since grade school and are a little worried about the changes that are certain to happen now that one of them is getting married. Don't worry not too much the Paul Feig directed the comedy is filled with emotional moments or wake-up calls in reality, you'll still get more than your fair share of jokes that are sure to cause some uproarious laughter. While the film may look like a total ensemble comedy, the film's focus is actually Annie, a former pastry chef now stuck in a menial job who is asked to be her best friend Lillian's maid of honor. An idea that sounds to be a lot of fun but after Annie meets Helen (Rose Byrne) another bridesmaid, the film shifts into a competition between the two bridesmaids vying for Lillian's affection and appreciation. Wiig excels at creating hilarious situations and making the competition a riot to sit through while Byrne is flawless as the high society friend who is hellbent on making herself look like the perfect maid of honor. A stellar example of this is the speech sequence at the engagement party. Wiig and Byrne exchange punches verbally meanwhile the audience is trying not to pee their pants from all the laughing these two cause with their rivalry speeches. The film does revolve around Annie and the mess her life is in, but we still get plenty of ensemble comedy from all the girls. For instance, when the bridesmaids go out for lunch and are fitted for their dresses, the audience is treated to probably the furthest thing you'd expect in a comedy from the female perspective, toilet humor. Other examples are their bachelorette trip or the number of parties thrown in Lillian's favor including the wedding. All these moments are filled with hilarity and keep the comedy bouncing back and forth between a ensemble comedy and a film following a 30-something woman coping with losing her best friend to marriage. 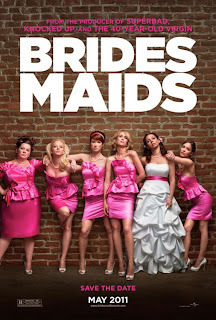 Kristen Wiig carries the female driven comedy on her shoulders but the entire cast of "Bridesmaids" is a riot. Particularly Melissa McCarthy. This firecracker of a woman steals nearly every sequences she is in. Whether it is her facial expressions, body gestures or actual dialogue, McCarthy is a blessing in this comedy. I've never seen her comedy styling's before but you can bet I will be keeping an eye on her in the future. Wendi McLendon-Covey who you probably know best from the Comedy Central show "Reno: 911" is also a barrel of laughs as the over-tired mother. McLendon-Covey's character Rita is never afraid to speak her mind and her delivery of the dialogue is both shocking and hilarious. Ellie Kemper from NBC's "The Office" felt under-used but based on how much is actually going on in "Bridesmaids" her minor character does make sense. Kemper plays the sweet and innocent bridesmaid Becca and after she's spent some time with this motley crew of ladies she quickly learns not to worry about getting her dress a little dirty. I could go on and on about the cast of "Bridesmaids" because as I said earlier everyone is a riot, but two final mentions must be made, Terry Crews and Jon Hamm. Crews plays a workout instructor that has a very brief but amusing scene and Hamm (in an uncredited role) plays a booty-call for Annie (well actually the other way around). Hamm is the picture of chauvinism as Ted but the way Wiig and Mumolo wrote his character he provides both cheers and jeers. "Bridesmaids" may be a bit long for some. The film does house two major plot devices and see's both of them through. As previously mentioned, we are following Annie and the lovelorn mess her life is in as well as a competition between two women over the affections of a common friend. I enjoyed both sides of the film but I could easily see where some audience members could find Annie's story a little long in the tooth. Particularly, the romantic relationship she develops with a local police officer played by Chris O'Dowd. O'Dowd's character is the most predictable aspect of Bridesmaids not to mention over-staying its welcome by about 10 minutes. Their relationship does have some high moments, but unfortunately that is all they are, moments. Outside of a very minor grip about the hammy relationship that is peppered into "Bridesmaids," this is one of my favorite comedies of this year and previous years. It is a film that has very high replay value and is over-loaded with side-splitting situations and jokes. There is one joke with Melissa McCarthy's character Megan that kept me laughing for a good couple of minutes, I mean I would think I would be done but then I'd start laughing all over again. There are so many laughs you will want Bridesmaidsto slow down for a second so that you may catch your breath. If you need a good escape or just a good laugh, Bridesmaids is the perfect movie. It is fun for both sexes and will certainly to leave you smiling from ear-to-ear.